Slime Climb is the fifteenth level of Donkey Kong Country 2: Diddy's Kong Quest. It is also the fifth area of Krem Quay. This is a unique rigging level, as the water continuously rises throughout it. In Diddy's Kong Quest, Diddy and Dixie cannot dawdle, as a Snapjaw lurks in the water, and it must be avoided at all costs. If they happen to fall into the water, the enemy quickly dashes up to them and attacks one of them. Klomps, Klingers, Krunchas, Klobbers, Neeks, Click-Clacks, Flitters, Zingers, and a single Kannon, all are obstacles in the Kongs' path to the top of the ship. This is one of the few levels in the game to contain one or more Invincibility Barrels. Diddy Kong stands at the beginning of the level. 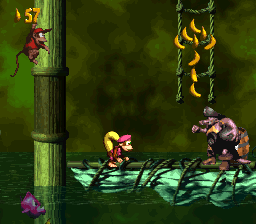 The Kongs begin the level on a yard that is positioned above the water but under a trio of bananas. Two more yards are ahead of here: The first holds a single Click-Clack, and the other carries two. A Banana Coin is between the two yards, and a super-jump or a Team-up move is required to reach it without falling into the water because of its location. The third yard in this area is also placed under some ropes with an arrow formed by bananas on it. They must climb upwards with these ropes, as directed by the arrow, in order to reach some higher yards that hold a Click-Clack and a DK Barrel. As they climb the ropes, the water rises, but then stops when they get on the yards. There are three smaller yards to the left of here, and as the heroes travel along with them, the water rises again. The first two yards hold one Click-Clack each, and the second one also holds a Kruncha. The letter K floats between the first two of the three yards as well, but it can only be grabbed with a super-jump or a Team-up move if the primates do not want to fall into the water. Some ropes are in front of the third yard, and they can be climbed to reach some platforms placed around some masts. Before the water rises too much, they must travel to the east by jumping from one platform to the next. One of the platforms holds a Klomp, and a Banana Coin is after this platform in a gap. Soon, the duo reaches a small yard with a Kruncha on it. Some more platforms attached to the sides of masts are to the left of here, and the heroes must use them to climb higher. As they jump from one platform to the next, a trio of Klomps try to impede in their progress; they also come up to a crate as they head across the area. Fortunately, the water ceases to rise as they move along these platforms. However, it begins to rise again soon after when they reach a nearby set of ropes, which hold a Klinger and an arrow pointing upwards that is formed by bananas. If the primates climb to the top of these ropes, they can find a straight tightrope to their right and a yard above this, which they can jump from to reach a hidden Auto Fire Barrel. This barrel can shoot them through a shortcut, into the letter O, and onto some yards found shortly before the Star Barrel. If the two friends climb along the tightrope to their right in the area under the Auto Fire Barrel, they come past a Zinger and onto a larger set of ropes that hold a few Klingers. 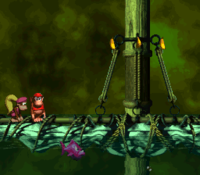 A DK Barrel is to the right of the ropes, which can lead the Kongs up to a separate group of ropes that are positioned to the right of the letter O. A Klinger also slides along these ropes, which can help them climb to a group of yards that support a pair of Click-Clacks. When the heroes reach this area, the water rises under the yards and stops. An Auto Fire Barrel is hidden high in the air to the left of here, and it can shoot the primates to many bananas, and then into an additional Auto Fire Barrel that immediately blasts them to the Star Barrel on a different yard. If the Kongs head to the right from the location of the previous yard, which holds the two Click-Clacks, they can reach the yard with the Star Barrel above it. A Banana Bunch is hidden in a gap to the left of it. The Kongs climb up some ropes and progress to a yard. If the Kongs head east from the Star Barrel, they reach a separate yard that holds a Kannon, who stands in front of an Invincibility Barrel. Some ropes hang above it, and as they climb to the top of them, they break through a DK Barrel and the water begins to rise again. The ropes lead onto a yard that is placed near a tilted yard that they must travel down to reach a more leveled yard with a Neek on it and a Flitter and a Banana Bunch above it. An angled yard is just ahead, and it must be traveled along to reach another yard that is tilted upwards. A gap is between the yards, and a Banana Coin is located in it. After they cross this gap, they reach the tilted yard, which is positioned next to a leveled yard with Click-Clacks on it. Some ropes dangle above these yards, and as they are climbed, the primates must watch out for a Zinger. Shortly after passing this foe, they reach a higher yard with a gap to the right of it. In order to cross this gap and reach the large set of ropes after it, they must either hover with Dixie's Helicopter Spin or use a Flitter in the gap to bounce onto them. The ropes hold a pair of Klingers, who climb up and then slide down on them. An additional Flitter is to the right of here, and the primates can bounce on it to cross a small gap and reach a yard that is tilted upwards. As they reach the end of the yard, they discover a smaller and leveled yard with a Click-Clack on it. There are some ropes above here that they must climb on order to progress. A Zinger flies in their way as they head up the ropes. At the top of the rope set, they can find another set of ropes to the left of them, which they must jump to if they want to escape from the rising water. The letter N is at the bottom of these ropes, which a Zinger flies over. They can find an additional set of ropes to the right of here, but a Zinger moves between the two rope sets. After the heroes pass this foe and reach the ropes, they must climb upwards past a pair of Zingers in order to reach a straight tightrope that they must climb along to find a wide gap with some Flitters above it. They must bounce on these moving Flitters to cross. 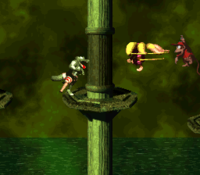 Dixie Kong hovers towards a Klomp on a platform. As they cross this area, the water ceases to rise, after rising to slightly under the Kongs. On the other side of the gap, they can find some more ropes that they must climb to the top of to make their way onto a large yard with a Banana Bunch-stealing Klobber on it. Before the water reaches the Kongs, they must hurry onto a tilted yard nearby that holds another Banana Bunch-stealing Klobber. If they cross the gap following this yard, they make their way onto another yard that supports a Kruncha. A rope set is above this foe, and the duo must climb to the top of it in order to reach another yard with a smaller yard above it. Once they get on the first yard, the water stops rising, but if they hop onto the yard above it, which holds a kannonball, it starts to climb again. There are four platforms attached to masts ahead of here; three of them hold Klomps, but the last of them supports a Kannon, which they can load with the nearby kannonball. The platforms must be used to progress to a small gap with a Flitter in it. They can use this Flitter to cross the gap and then reach a yard with some ropes above it. Once they reach the top of these ropes, they jump onto a yard that holds two Click-Clacks, and the water ceases to rise. An Invincibility Barrel is hidden in the top-left corner of this area, and if the primates hit it, they become invincible temporarily. They can use this short-lived ability to grab a DK Coin hidden under the level's exit in the water. In the Game Boy Advance version of the game, a Golden Feather is also hidden in the water to the left of the coin. The End of Level Target is on the other side of a gap from the location of the Kongs' location at this point. They can cross this gap by bouncing off of a pair of Flitters that fly in it, and then by accessing a Barrel Cannon that can shoot them onto the nearby yard. This yard holds the End of Level Target, which the Kongs must hit in order to complete the level. If they hit this target immediately after shooting out of the previous Barrel Cannon, they win a prize from it. A Barrel Cannon is placed to the right of the End of Level Target, and it can blast the heroes into the Barrel Cannon placed to the left of it. K: West from the location of the first DK Barrel in the level, the heroes can find the letter K in front of a yard. They must use their super-jump move to grab it. O: The letter O is located next to a set of ropes found to the left of the second DK Barrel in the level. N: After the Kongs pass the third DK Barrel in the level, they reach a set of yards that they must travel across. By using some ropes, they can reach a higher set of yards with more ropes above them. As the heroes climb these ropes, they can find the letter N hidden at the bottom of a rope. G: To the left of the kannonball, the heroes can find a trail of bananas. If they follow this trail by swimming through the water, they reach a hidden yard that holds two Banana Bunches, a DK Barrel, and the letter G.
Shortly after the heroes pass the Star Barrel, they find a Kannon standing on a yard next to an Invincibility Barrel that, if touched, can give them temporary invincibility. Therefore, if they touch it, they can swim through the water without being damaged by the Snapjaw. After they touch this uncommon barrel, they must head into the small gap to the left and follow the underwater path of bananas, which lead them to a Bonus Barrel. They barrel sends them to a Bonus Level, where they must collect 70 stars in 25 seconds by hopping off of some ropes floating in the air. When all of the objects are collected, a Kremkoin appears to grab within the remaining time. If the heroes fail to collect the coin before time expires, or if they fall into an abyss, they lose the Bonus Level and must reenter it to have another chance to win the coin. Near the end of the level, the heroes can discover kannonball sitting along a wooden platform on a mast. They must pick it up and hop across the nearby platforms, which hold Klomps that try to impede in their progress. Soon, they primates come up to a kannon, which they can load by placing the kannonball into it. If they enter the kannon while it is loaded, they are shot to a Bonus Level, where they must defeat three Flitters and two Zingers in 25 seconds. The insect enemies are mostly positioned high in the air, so the Kongs must jump on platforms to reach them. There are kannonballs on some of the platforms, and they can be used to defeat the enemies. A DK Barrel is also at the start of the bonus to defeat enemies and additionally save an missing partner. If the primates defeat all of the enemies before the time limit is up, a Kremkoin appears at the top of the stage for them to grab. The group approaches the level's DK Coin. When the Kongs reach the highest yard at the end of the level, they should find an Invincibility Barrel hidden in the corner of the screen. While using their Team-up move, they need to toss one another into the air and break the barrel, giving them temporary invincibility. After this, they must jump into the gap below the two nearby Flitters and swim east, where they should be able to find a DK Coin. As they swim towards the coin, their invincibility protects them from the Snapjaw's attacks. Almost immediately before the end of the level, the heroes must look to the left, where they can discover an Invincibility Barrel. With their Team-up move, they can reach the barrel and become invincible for a short amount of time. While invincible, they must jump into the gap to the right and swim slightly to the left, where the Golden Feather is located. As they swim through the water, their invincibility protects them from the Snapjaw's attacks. Diddy Kong throws a Click-Clack in the original version of the level. 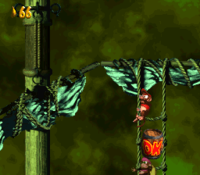 The Kongs climb ropes in the Game Boy Advance version of the level. This page was last edited on April 6, 2019, at 01:56.